Abstract: The P4PA supports existing 400MHz based Pentium 4 processors, and goes an extra step further by including support for the up and coming 533MHz Pentium 4 processor. VIA's movement into selling its own branded motherboards has been received farily well by the industry, and as the boards are produced by existing companies under licence, many of the early glitches you might expect from an upstart are thankfully absent. The VIA mainboard we are examining today is the just released VIA P4PA which has a very FIC or Asus feel about it (we're not saying it was built by either of them because we really don't know), and it certainly performs like a champ! The P4PA supports existing 400MHz based Pentium 4 processors, and goes an extra step further by including support for the up and coming 533MHz Pentium 4 processor. This is great for peace of mind in terms of upgradeability. Two other forms of future-proofing are included on the VIA P4PA; an onboard network card, and USB2.0 controller. It's really sad to say that the MAC world has been beating PC's blindly on this front for many years. As broadband is the preferred means of connecting to the internet, NIC's (Network Interface Card) are basic required equipment these days. By including the NIC on the mainboard, and locating the RJ-45 jack just above the two USB ports, consumers can save a few dollars, and some time as they no longer have to buy and install the card in an empty PCI slot. The onboard 10/100 Ethernet comes thanks to the RT8100A controller, and along with onboard audio using VIA's AC'97 codec, the VIA VT6202 chipset also brings support for USB2.0. While the P4PA undoubtedly has many good features going for it, no mainboards can really be considered complete without an onboard IDE RAID controller. The P4PA lacks IDE RAID, which is a shame as most mainboards in the P4PA's class have it. 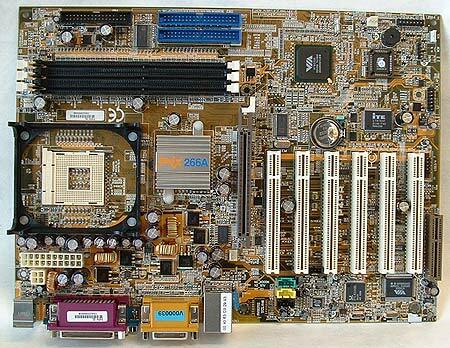 The VIA P4PA is based on the VIA Apollo P4X266A chipset which a good performer. The P4PA comes packing three DDR DIMM slots (most Intel i845-D boards only have two) which support up to 3 GB of either PC1600/PC2100 DDR RAM that is non-ECC. The general layout of the PCB is one of those things you don't notice until you try to install components. If the components are laid out poorly you may have problems installing items, or have to remove one component to reach another. This may seem trivial until you are behind your desk trying to install a new video card, then realize you have to remove all the memory first, or vice versa.